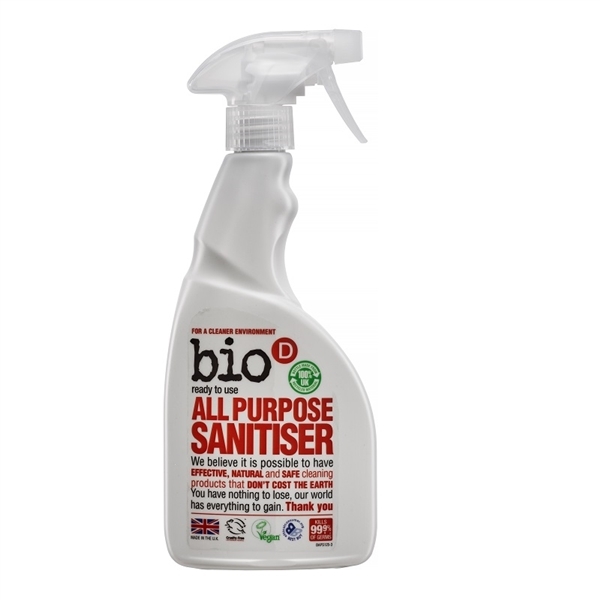 The Bio-D All Purpose Sanitiser is the perfect all-rounder, providing quick and effective cleaning with it’s ready-to-use formula. Simply spray the desired surface and wipe clean with a damp cloth. Not only is the formula powerful in removing dirt and grime, it also protects against E-Coli and salmonella while remaining gentle on the skin. We now have a Bio D Refill Station in our showroom at Kirkby Stephen where you can refill this product. Love all the Bio D products as we are a vegan B & B and these are vegan society approved and cruelty free. Excellent products that work well without costing the earth- literally! A re-order, a reliable product. This product had actually spilled in transit. I have since bought the refill container and really like the product. - Out of Eden - A full refund for the damaged 500ml Spray bottle of the Sanitiser has been issued for our customer. We are really pleased to hear that she is happy with the product and has since ordered the 5 litre refill.